BUY ONE, GET COMPANION FARE AT 1/2 PRICE! The following itinerary is a sample only. We could make changes recommended by our guide to maximize potential sightings, based on information available at the time of our visit. After breakfast this morning, we will visit birding sites near the field station in Gamboa. Over 190 species have been seen just in the yard of the field station! Other nearby sites we will visit include the Ammo Dump Ponds (where we might see White-throated Crake), the banks of the Chagres River, and the entrance to the famous Pipeline Road. Some of the bird species we expect to see in the gardens of the lodge include Red-legged and Green Honeycreepers; Blue-crowned Motmot; Crimson-backed, Blue-gray, and Palm Tanagers; Gray-headed Chachalaca; White-necked Jacobin and Rufous-tailed Hummingbird. Expect to see Agoutis beneath the feeders, and watch for Geoffroy's Tamarin in the trees near the patio where we have our meals. Near the lodge, we usually see Keel-billed and Chestnut-mandibled Toucans, and often sight a Bat Falcon near a nest tree. At the Ammo Dump Ponds, in addition to the elusive White-throated Crake, which is almost always heard but rarely seen, we might find Rufescent Tiger-Heron and other wading birds. Along the Chagres River, we will look for passerines as well as wading birds, shore birds, and raptors. We might find Capybara foraging among the lily pads with Purple Gallinule and Common Moorhen. Expect your first day's list to be chock-full of lifers! Today we will have the opportunity to hike along the world famous Pipeline Road at the Soberanía National Park. With just over 48,287 acres, this park boasts outstanding biodiversity, including most of the 500 species of birds recorded for the Panama Canal area. Frequently you can come across a mixed-species foraging flock containing literally dozens of different birds like Dot-winged and White-flanked Antwrens, Fasciated and Western-slaty Antshrikes, Plain Xenops, Olivaceous Flatbill, Black-tailed Flycatcher, Cocoa Woodcreeper, and many more. This area is also famous for the occurrence of Army Ant swarms who, by raiding the forest floor, flush out many insects that in turn attract a series of properly named Antbirds. Possible are Spotted, Bicolored, and Ocellated Antbirds, along with many Woodcreepers including Northern-barred, Plain-brown, and Black-striped. In addition, you may come across a Gray-headed Tanager, or an opportunistic White-whiskered Puffbird, or even an elusive Streak-chested Antpitta. After lunch and a break at the lodge, we will return to explore further on Pipeline Road, including some of the trails around the Rainforest Discovery Center. We will be on the lookout for interesting inhabitants of the lowland rainforests including Black-chested Jays, Black-breasted Puffbirds, Purple-throated Fruitcrows, among many others. In addition, we will also search the skies above for raptors like White Hawk, Bat Falcon, Black Hawk-Eagle, and perhaps even a majestic King Vulture. Some rarities are possible here, including the elusive Pheasant Cuckoo. This morning we will leave the lodge very early to catch a flight to the western highlands. We will see first-hand why Panama harbors such high biodiversity as the landscape changes dramatically during our short 50-minute flight to the Chiriqui Province (airfare included). Upon arrival in David, we will spend some time birding near the airport, where a wide variety of species can be seen. Brown-throated Parakeet, Pearl Kite, Yellow-crowned and Red-lored Parrots, Black-hooded Antshrike, Mouse-colored Tyrannulet, Veraguan Mango, Mangrove Warbler, and Fork-tailed Flycatcher are but a few of the possibilities. Our next stop will be in a moist valley near Cuestra de Piedra. Cherrie's Tanagers are abundant here, along with White-collared Swifts and Lesser Goldfinches. Snowy-bellied and Charming Hummingbirds feed on some of the plentiful flowers in the area, often joined by Brown Violet-ear. Near the stream, we might find Buff-rumped Warbler and Louisiana Waterthrush in the undergrowth while the nearby shrubs and trees host other migrating warblers (we saw Golden-winged in 2011). Wrens, Tyrannulets, Furnarids, Manakins, and other bird families are all well represented in this lovely area. After lunch at our hotel, we will explore nearby forests in search of foothill bird species. We will start by visiting the Volcan Lakes where we may discover some waders like Northern Jacana, Green Heron, and Great Egret. Least and Pied-billed Grebes are usually seen on the water, and if we're lucky, we might find Masked Duck in the brushy areas along the banks. In addition, the lush forest around the lakes may yield Olivaceous Piculet, Slaty Spinetail, and possibly the nearly endemic Fiery-billed Aracari. As we return to our hotel in the evening, we will witness a small rookery as it fills with various egrets and herons as they return to roost for the night. We might even be able to locate a Tropical Screech-Owl that is resident near the hotel. Early in the morning we will travel into La Amistad International Park (jointly protected by Panama and Costa Rica). Upon our arrival, we will be served an authentic Panamanian breakfast in a charming little restaurant just inside the park boundaries. As we enjoy our morning meal, some of the more common and obvious species of the park, such as Yellow-thighed Finch, Ruddy-capped Nightingale-Thrush, Chestnut-capped Brush-Finche, and Magnificent Hummingbird will entertain us. Endemism is high in this Important Bird Area (IBA) and we will make special efforts to see many birds restricted to the Chiriqui/Talamanca Range. We are not only referring to the well-camouflaged "LBJ"s like Zeledonia or the skulking Silvery-fronted Tapaculo, but also to some of the most gaudy birds in the World, like the Spangle-cheeked Tanager, Collared Redstart, and the Flame-throated Warbler. 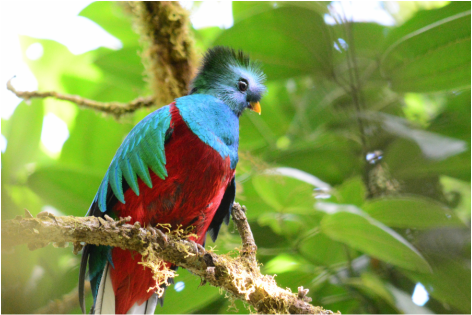 La Amistad is our best chance for finding the breathtakingly gorgeous Resplendent Quetzal. We will enjoy a delicious lunch inside the park and continue birding in the afternoon, taking full advantage of our day here. Please note: La Amistad received extensive damage in flooding that occurred in late 2014. The restaurant mentioned above will most likely not be rebuilt, so changes in this day's itinerary will be necessary. As we drive back to Volcan in the afternoon, we will stop at a Bed & Breakfast to observe the activity at their bird feeders and in the gardens. Violet Sabrewing, Stripe-throated Hummingbird, Green Violet-ear, and White-throated Mountain-gem are among several species of hummingbird that frequent the well-stocked feeders. A myriad of species visit the fruiting trees in the gardens, including Silver-throated and Flame-colored Tanagers, among others. Our final stop for the day will be a brief one to find a specific target species, Torrent Tyrannulet. These diminutive and active birds have been resident on the grounds of a local hotel for several years. Today we will explore the forests of the Los Quetzales Trail at the Baru Volcano National Park. Because of its importance in preserving unique elements of the flora and fauna, the UNESCO has declared this area a Biosphere Reserve. Amidst the moss-covered, epiphyte-laden trees of the cloudforest we may spot Buffy Tufted-cheek, Sooty-capped Bush-tanager, Long-tailed Silky-Flycatcher, and Large-footed Finch. Flowering bushes by the trail may yield White-throated Mountain-gem, Stripe-tailed, Scintillant, and Volcano Hummingbirds. Volcan Baru is our best chance for finding the breathtakingly gorgeous Resplendent Quetzal.Later today, if time permits, we will visit the Dracula Orchid Farm where we will enjoy seeing hundreds of these enchanting flowers, all the while staying on the lookout for Silver-throated Tanager, Black-faced Solitaire, Ruddy-capped Nightingale-thrush, Magnificent Hummingbird, and others. In the evening, we will catch a late flight back to Panama City. We will drive back to the Soberania Field Station and Lodge upon our arrival. Our overnight stay in Torti will afford us the luxury of birding San Francisco Reserve and the Bayano Valley without the very early (4:30 AM!) departure that is normally required to be on site by 7:00 AM. Bayano Valley is an important birding locale because it represents the western-most limit of the range of many Darien endemic and specialty birds. The habitat in the valley consists of forests that protect the Bayano River watershed, riverine woodlands, scrub, and open savanna. Birding can be done by road and along several trails within the valley. A reservoir within the valley provides habitat for a variety of aquatic birds and is nearly the northern-most limit of the range for Cocoi Heron. Today we will visit Summit Ponds and walk along Old Gamboa Road. At Summit Ponds, we should see multiple species of Kingfisher and Boat-billed Heron. If we're exceptionally lucky, we may catch a glimpse of a Capped Heron. Along Old Gamboa Road, we hope to find a pair of Spectacled Owls that have been present in this area for many years. Other difficult species that are possible include Rufous Nightjar, Rosy Thrush-Tanager, and Black Hawk-Eagle. After lunch, we will to drive to the Miraflores Locks near Panama City. Following a quick tour of the museum, we'll spend some time watching ships move through this wonder of the modern world. Deposit of $500 with registration (registration form is at the end of this flyer). Balance is due on or before September 21, 2015.